A bat-winged spike dipped in venom loaded into a hollow tree haunts this trap. The slime trails behind the spike when fired and once it makes contact, the reservoir slurps the rubbery fluid back into the base, consuming the captured mouse with it! The Haunted Dragonslime Ballista Trap Skin can be used on the Dragonvine Ballista Trap trap. The trap's stats (power, power bonus, attraction bonus, etc.) are not changed. 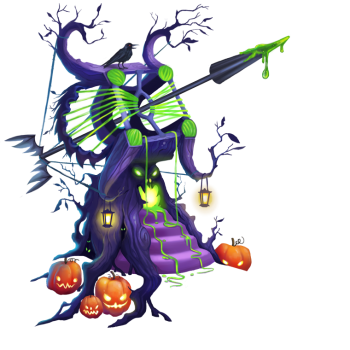 The Haunted Dragonslime Ballista Trap Skin obtained during the annual Halloween event. 17 October 2017: The Haunted Dragonslime Ballista Trap Skin was introduced with the start of Creepy Carl's Cursed Cruise.